Moscow broke communion with Constantinople over this and Constantinople said they refuse to break communion with Moscow. I pray and hope God intervenes once again and pacify His bishops. Up to this point it really looks like it's more a show of power from Constantinople vs. Moscow and vice versa. Both Russian and Greek Orthodoxy are very influent and we all respect them both. But the discussion about the purity of one vs the other does not give sign of Faith but of pride. And yes the politicians who always win something when the Church can be manipulated as an organization and not as the spiritual Bride of Christ. Actually, you are completely wrong re: Ukraine belonging to Moscow. Completely and absolutely and you defend the Russian position which is your right, of course. As for cultural identify of the Churches, Christ DID tell His Apostles to baptize all NATIONS. It is impossible to even conceive of a church that is somehow without a cultural orientation. Not in the Orthodox Chuches, and not in the Roman Catholic. It is a very American thing to conceive of a church which is culturally neutral (meaning "American"). As for politics, it has been going on within the Russian Orthodox Church for a few centuries, are we only now beginning to notice? Do we think the MP is free of political intrusions from the Russian government? Again, it's a free country. And in any event, the Ukrainian Orthodox have are moving ahead with their dream of an autocephalous Church with or without our permission or discussion. And "Svyatoslav" (is he some buddy of yours we don't know about?) is saying what Ukrainians in general would say. You speak of the situation as if the EP is granting the Tomos of Autocephaly unilaterally and without referencing the Ukrainian Orthodox, including hierarchs from the MP, who petitioned the EP for it. There are also many in the MP in Ukraine who will leave it for the new Autoceaphalous and Canonical Ukrainian Orthodox Church and that process is only beginning. You won't be able to convince Ukrainians that they should somehow be under Moscow. Yes, they have rights and aspirations for freedom from an "elder brother" who has smothered them spiritually, culturally and nationally for too long. You have the right to defend the ROC position. But many will tune you out as well. Last edited by Orthodox Catholic; 12/20/18 06:32 PM. Greetings from this half-Romanian! I noticed that in your post about the Ukrainian Orthodox situation you never once mentioned anything about what the Ukrainian Orthodox want - only the struggle between Constantinople and Moscow. 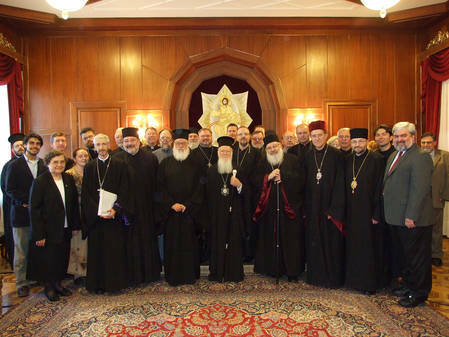 In fact, the Ukrainian Orthodox hierarchs - including hierarchs from the Ukrainian Orthodox Church, Moscow Patriarchate signed a petition to Constantinople for the EP to grant them a Tomos of Autocephaly just as the Romanian Orthodox Church is an autocephlous patriarchate. To understand this situation, we need to delve into church history and the history of the ROC with respect to the Church of Kyiv. I will be working on a doctorate in this area of study and suffice it to say that it is both complex as well as fascinating. The Moscow Patriarchate not only claims Ukraine as part of its jurisdiction but also blames Rome for renewing the Union of Brest with the comeback of the Ukrainian Greco-Catholic Church after 1991. So both the Young Fogey and myself are already in Moscow's bad books for being aligned with the Ukrainian Catholic Church (I dont know if this will prompt the Young Fogey to reconsider his attendance at a UGCC parish since he seems to be squarely on the side of the ROC . . . kidding! ). The church situation over there is now very delicate and we all need to handle it with . . . prayer. Just a note to say that I did not come back here to bicker but I stand behind what I said above. I wish everyone a happy and holy Nativity season and New Year! Anyway, this whole row in the Ukraine is unseemly and makes our work, of bringing ALL the Orthodox into the church, so much harder. I don't know if you have ever followed any ecumenical dialogues or the Catholic Church's ecumenical statements since 1965, but I am aghast at a statement like this after 1965. The Apostolic Churches, of which the Orthodox Church is one were never under the authority of the Pope of Rome in history. And the goal of our ecumenical efforts, as Archimandrite Robert Taft of thrice blessed memory once put it in an interview posted by link on this forum, is communion. In fact, that is all Fr. Robert said we would ever get or hope to get. The Orthodox Churches are already IN the Church established by Christ and have been since their establishment by various Apostles--other than St. Peter. In addition, the current Roman definitions of papal authority--the papal claims--were not articulated in the current form until Vatican I. If you want a real look at history, you would have to understand that Rome spoke in terms or mediating various disputes, but was outside the mainstream after the Empire moved east to the Bosporus.
. . . the original canonical Orthodox there, the Russian Orthodox Church, Metropolitan Onuphrey of Kiev, and what was ex-Metropolitan Filaret's Kyiv Patriarchate, now Constantinople's metropolia there possibly becoming autocephalous: Metropolitan Epifany. I don't fully understand how the Orthodox determine who is "canonical" and who is "uncanonical," but it seems to me to be a bit more fluid than stating that one group is canonical and another is not. Six months ago there were two groups in Ukraine that were considered uncanonical by the rest of the Orthodox world. Suddenly the EP recognized them and they are canonical. And there is no mass ordination of each and every cleric involved. So stating "the original canonical Orthodox" is something that can change overnight. There is just too much packed into a few sentences to comment about. See Dr. Roman's comments above. If he can do a whole doctoral dissertation on this historical and religious situation, it flies in the face of reality to make simple statements like this. Actually, it can be argued that the "rightful Metropolitan of Kiev" is Major Archbishop Sviatoslav since at one point in history the entire Kyvan hierarchy--with the exception of two who fled to Russia--moved to communion with Rome due to many factors. So there is more than one person who can make claim to that title. I think this statement needs the addition of "with." We ought to be concerned with reconciling WITH all the Orthodox now. Remember Fr.Taft's statement that all we will ever get is communion, nothing more. I made a post here once that seemed to sum up some of these issues. One thing I believe is that the Vatican's Oriental Congregation would have to be abolished. No eastern bishop would ever again answer to a Roman body of any kind. If an issue came up, the issue would go to that bishop's synod or patriarch and wold be dealt with there. Any issue between patriarchates would have to be dealt with by some sort of ad hoc committee appointed by the various heads of the Churches and any actions would only be binding by consent. There would be no presumption that the Latin patriarch would make binding statements for the whole Church without consultation and consent by the other patriarchs. There were other points, but you get the idea. This battle of the canonical patriarchs shows there is no such thing as the Orthodox Church; they're all independent. There is an Orthodox tradition, but only the Catholic Church has authority. This is so over the top it defies any kind of rational answer. Please read the Documents of Vatican II for the Catholic Church's position on these matters: sister Churches; authority, etc. As for your contention that people did not care what country their village was in, the fact is that the Church defended and preserved the culture and identity of people when the political landscape changed. It was this way in Poland where the Latin Catholic Church kept Polish identity alive when the country was partitioned three times in history. Ukraine is similar in that the Ukrainian Church kept the culture and identity alive when the area was conquered by outside forces, whether Russian or Austro-Hungarian empire, among others. If that were not so, why did Khrushchev try to erase Ukrainian identity during his tenure as head of the Soviet Union--I am old enough to remember reading about this in the news. 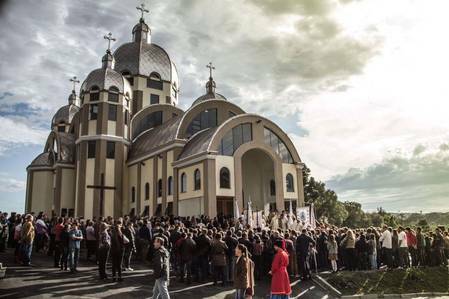 And why has the ROC tried so hard to russianize the Ukrainian Church, if this were not so? The fact that the American Catholic Church has such a loose hold on people is that there was a movement to stifle ethnic identity among our people in the last century. And the carry-over reached the Eastern Catholic Churches, causing the so many people to go to the OCA and ACROD. My home parish was originally Irish and German. Everything was on some sort of detente between the two groups until the southern and eastern Europeans came along and the pastor forced the parish to accept them "because we are all Americans now." Well, that didn't go over so well and the tension was still present when I left there, after being a seething thing for the better part of the 20th century. But, pat yourself on the back today because you've probably set back any ecumenical progress of the past 50+ years with your post above. In the meantime, you owe our Orthodox brethren an apology for your unkind, un-Christian statements. Just to echo Bob's statements above, I find what you have said extremely uncharitable towards Ukraine (yes Ukraine, NOT the Ukraine) and towards the Orthodox Church as a whole. I agree with you on the fact that being a Christian is about Christ first and foremost, not ethnicity. However, ethnicity, just like religion, is very important to people's identity. For many years, the Russians have tried to destroy Ukrainian culture and Russify the Ukrainian people, as Bob has said. So I, along with many others, would only think it natural and in fact logical to want to have a Ukrainian Church independent from Russia where they do not have to be forced to use Russian music or Church Slavonic. They should be able to use the Ukrainian language in their liturgy and preserve their customs. Just a side note here, I must say I was horrified about the way you spoke about Patriarch Sviatoslav. He is a wonderful man who has done much for his flock. Comparing a bishop of the Church to a western liberal is extremely disrespectful, especially a bishop such as Patriarch Sviatoslav who has nothing but love for God and his Church. Charity forbids me from mentioning worse things that some of the Latin bishops have done, but keep in mind that some bishops are worse than others. And let's be real here, if Constantinople had not stepped in and helped Ukraine gain independence, there would never have been an independent Ukrainian Church. Russia had their opportunity to help create an autocephalous Church, yet they have done nothing except creating a Russian-controlled Patriarchate. "All right; I'll GO to hell." Seriously, you're not getting any apology. 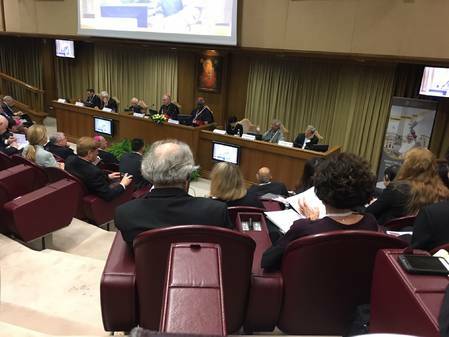 Bob: Catholic teaching CAN'T change, no matter what erroneous readings of Vatican II such as Elias (Zoghby)'s say. EVERY ancient church, including us, claims to be the only true one. So do the Orthodox. Think I'M mean? Actually one of the things that sold me on Catholicism is we recognize a great Catholic family of valid orders even estranged from us. We include the Orthodox. They don't include us. Strictly speaking, not only don't they recognize our orders. They don't recognize our baptisms! Few rebaptize but it's a valid option among them. 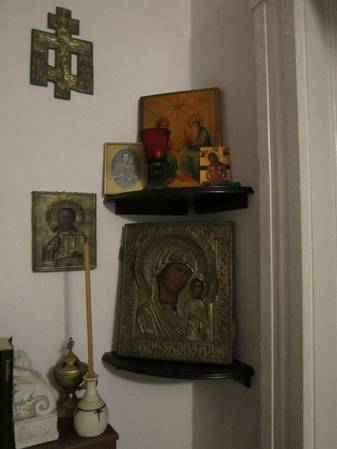 Born Orthodox get the benefit of the doubt; after all, I worship with them! There is an Orthodox TRADITION I am happily a part of. But there is only one CHURCH, the Catholic Church. "Sister churches": see above on the great Catholic family. The Archdiocese of New York and the local Greek Orthodox metropolis are sister churches, albeit estranged, one being outside the church. The Catholic Church as a whole has no sisters. Too many people think there can be "intercommunion" like two mainline Protestant denominations trading altar and pulpit privileges. Not so here. You don't "enter communion with Rome" or with Orthodoxy; you become Catholic or Orthodox. If you don't think the true church is under the Pope, you're not really Catholic. EVERYTHING that's not doctrine is on the table. 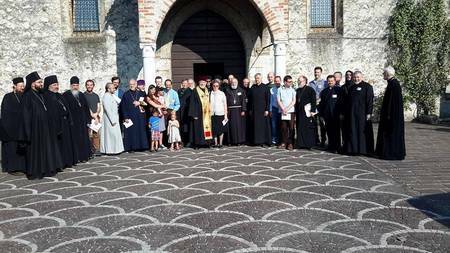 Abolish the Congregation for the Eastern Churches? Yes! At last, something we have in common! I have no use for the late Archimandrite Robert (Taft). God have mercy on him. I am a traditionalist. Funny thing, though, Bob: radical traditionalists think I'm you! What with my consorting with the Orthodox and telling these folks that no, they can't have public recitation of the Rosary in Byzantine Catholic churches. "But Our Lady promised all these graces for the WHOLE chuuuuuuuurch!" Then I have to explain that private revelation isn't our doctrine, the church protects the integrity of its rites, and the Roman Rite parish is a few blocks over if you want that stuff. "Now run along; God bless you." That two canonical Orthodox churches are at each other's throats, excommunicating each other and not recognizing each other's orders (which theologically is hash), etc., shreds the whole notion of canonical Orthodoxy! You just have a gaggle of bishops who happen to have valid orders and a traditional rite. Again: there is no Orthodox Church. Church Slavonic is the traditional liturgical language of Ukrainian Catholics. Sure; I can criticize Metropolitan Sviatoslav. I'm not a priest; I don't have to work with him. Being Catholic doesn't mean you have to believe he and the current setup with Byzantine Catholics are perfect. We actually hope this setup is temporary! I mentioned earlier that the fact that it's not perfect reminds me we have a lot of work to do to reconcile the Orthodox. No one has asked you to or told you to or demanded that you GO. I have to wonder about the great hatred you seem to hold inside. That hatred is not something you obtain by staying close to Christ, to the Church, or to the sacramental system given to us to help root out this sort of thing. It's something that rots the soul. I recommend you go to Town Hall and reread the "Who we are" post by Neil and then reconsider if this forum is a good fit for you. We can disagree here but the tone is not something we encourage. Our goal is to learn to see the world through the eyes of our brethren who are placed by the Lord in other places than we are. One thing I have learned in over a half century working with all kinds of people, including those who have no faith whatsoever, is that people don't NEED us. What we have been given is for us to give away, to share. No one likes to receive anything from anyone who is abrasive. The question we ultimately have to answer is whether we have been the face of Christ to those around us--have we been drawing people to us, to what we have, to what we believe, to how we live. If not, we have failed twice:we have failed the Lord Who has given us this mission by our initiation into Him and we have failed our brother or sister in the human family to whom we have been sent in the moment. First of all, Church Slavonic is the traditional language of Ukrainian Catholics, just as Latin is the traditional language of Roman Catholics, but we see how often Latin is used in mass don't we? There is no point in using a language that people don't understand if they don't want to use it. If Sts. Cyril and Methodius shared your attitude, they would have kept the liturgy in Greek. I strongly disagree with your statement that the Orthodox Patriarchates aren't in communion with each other (with the obvious exceptions of the ones that have excommunicated each other). Your only reasoning is that they are different ethnic groups, so they're not united. Couldn't the same be said of the Catholic Church? And just so everyone reading this is aware, I am not bashing the Catholic Church nor am I promoting either religion above the other. That's not what I'm about. But just as the Orthodox Church has issues, so does the Catholic Church. There's the SSPX, "Catholic" Women priest, Old Catholics and other groups that all call themselves Catholic. Not to mention, there is a huge division in the Latin church between traditionalists and modern priests with traditional priests often being reprimanded by their bishops for simply following tradition. It is the unfortunate reality that both the Catholics and the Orthodox have problems that we must sort out. With God's help, we will solve these issues but it won't happen if all we do is fight each other over things that should have been worked out ages ago. This thread is off its original topic and I am locking it.